Patricia reveals her upbeat and insightful personal story of the relationship she had with her youngest sister - her friend, her confidante, her soul mate. Their lives constantly intertwined, both growing up in the Upper Peninsula of Michigan and living 2,500 miles apart as adults. Now God takes you on the Journey from Grief to Gratitude to a place of inspiration and acceptance. The faith Patricia has her sister’s life was not in vain calls her to share her gifts with you. By embracing her sister’s wit, charm and beauty she weaves together a meaningful story of love and courage you can reflect upon as you travel your own life’s path. My sisterRoberta died over twelve years ago from lung cancer. This event changes me every year, bothemotionally and spiritually because I look at life with more mindfulness andgive myself the freedom for new perspectives.During the years since her death I have become more in touch with myfeelings. I forgive more quickly and Iam more grateful. My faith has risen toa new level, and I am generally at peace with my life. The loss of my sister was not in vain but anopportunity for growth and to practice the gifts she gave so freely - the giftspresented here in this book. God gave me agift after her death too in a kind and loving husband. The kind of person my sister often imaginedfor me. I accepted this gift in herhonor. To remember her courage gives memy life back, a life that floundered in disconnected relationships of the past. I found a true appreciation of forgivenessand gratitude as I passed through my grief. To look back onthe six years of this book's journey is a joyful experience. Thereality of how far I have come is apparent to me each day as I reflect on allthe experiences. The opportunities with being an author, and the incrediblepeople I meet who believe they are destined to read my story, is heartwarming. They help me heal even further. The support I receive from such organizationsas the Arizona Lung Association, who promote my book and workshop in theirDesert Pathways newsletter, is a testament to the theory a book has a mind ofits own. To all of you I say thank you. Looking back atthis book published parallel to my path of grief I am amazed a work written to sharemy love for my sister speaks to so many about grief. My sister's been gone many years now, but themessage remains the same. Hold tight tothose you love, and remember them always in your heart. It's no longerthe pain I had in the beginning, but an ache that is different. It will be a part of my life forever becauseit was a traumatic loss. Death of a loved one is one of the most difficultthings any of us will face in life; we are forever changed by it. Being able to share my love for my sister andthe pain of her loss in this book is incredibly healing. It allows me to come to terms with loss in anew phase of my life. A life that goeson with her still is always on my mind. Knowing othersin my grief support family are willing to listen to me and answer the questionsI need to ask is helpful. They allow meto come back to me. I reciprocate in myheart and by listening to them. TheJourney from Grief to Gratitude workshop (see appendix outline) done with thisbook, and in her memory, allows me to give back. Others in need of healing from grief respondand I am at my true center. Because friendsand family admit they do not have all the answers during years of sorrow, Ichoose to face grief courageously but cautiously when it appears. It is aprocess and one we each take at our own pace and in our own way. We have help available if we look for it alongwith others who travel the grief path.We can ask them to join us. I ama willing student on the subject and thus my Journey from Grief to Gratitude workshop continues to develop. It is my opportunity to share my story and beof service to those grieving. It's avehicle for my own healing while my strengthened faith remains the greatestgift since this loss. My spiritual quest continues to be fed and I now knowpeace. The honesty ofthe other authors I read who write on grief give me a new appreciation andenlightenment on the subject. I am more resilientas time heals wounds. Although the painof the loss never completely goes away it does go to a different place and wecan go on with our lives. It is withmuch gratitude for this knowledge I take my book to a new place too. Many of my friendsoffer me reassurance, acceptance and caring.These gestures of kindness helped me to write, and later revise for thisedition, a book that reveals uncovered depths of my emotional life. My workshop, with a goal of helping others ingrief discover their new being, is a direct response to those who were my firstreaders. Thank you to allthe people who read my book, attend one of my workshops and offer feedback. Your open and honest sharing of your griefstories gives me even more understanding about my own loss. Your allowing me to share my feelings is catharticand a big part of my journey home. The journey fromgrief to gratitude can be long and very difficult at times, but it is also apath to forgiveness and joy if we are open to the people we meet along the way. To care about ourselves and others is God'splan for all of us. Regardless of whatchallenges are in our path today, growth and awareness can be part of thejourney. We eventually realizewe are not alone in our grief and that we all grieve in our own ways. Regardless of how raw we are in thebeginning, we come to realize we have to talk about the death of our loved oneto heal. This is how we gainindependence from grief. Writing thisbook allowed me to talk it out. Thejournal pages and questions here should help you to talk it out too. My sister isdeep within my heart and soul today. Ido very few things now where I don't ask myself what she would think or sayabout my decision. The enormity ofanything is paled when we are side-by-side in our hearts with the one who haspassed away. I keep Gifts of Sisterhood close to me for guidance. It was written for a reason. There was a plan for the book and itcontinues to unfold in a beautiful way.Now as an E-book it will be even more beautiful and useful. It's comforting to me to have her spirit inmy life. She did not die in vain; shejust moved me closer to God. Patricia published this memoir as a celebration of hersister's life and is currently working on another memoir and a non-fictionwork. The non-fiction is on her recovery from trauma and surviving violentcrime twice. The other is about Alzheimer'sdisease, the disease that took her mother's life the year before her sisterdied. Patricia is in a research study at Mayo Clinic/Scottsdalefor Alzheimer's and is active in the community speaking out on women andviolence for research on both of these books. She has written many articles, short stories, editeduniversity curriculum and developed a career of seminar presentations. As an inspirational and motivational speaker,she has contributed to the development of successful men and women for manyyears. She makes her home in Scottsdale,Arizona, maintains a blog and continues to develop the Scottsdale Society ofWomen Writers. Patricia added herpublishing consulting business in 2007 to her repertoire as a publishingconsultant/author's partner - she helps potential authors through the mazeof independent publishing with a "jump start" launch to their books by puttingthe team together to make independent publishing an exciting journey. 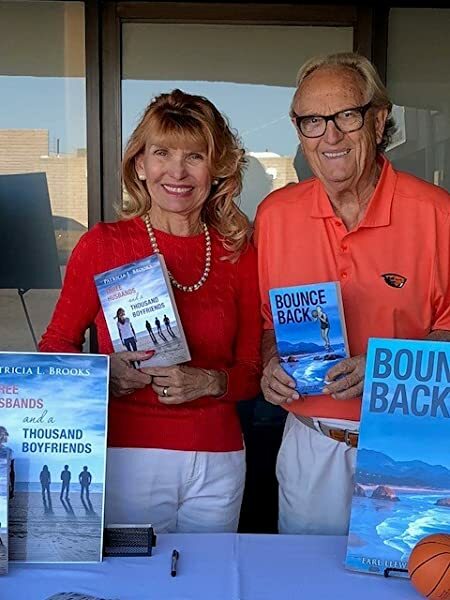 ·The AZ Book Publishers Association. The Journey from Grief to Gratitude workshop that supports Gifts of Sisterhood featuring Patricia'spersonal experience and expertise in dealing with grief is featured in thisbook. Her mission with this workshop is toenhance the spirit of the attendee's experience. Satisfaction is always guaranteed. Patricia has been a university faculty associate for almost20 years and is currently affiliated with Arizona State University. She holds a Masters Degree in OrganizationalManagement, the Advanced Toastmasters designation and was named to Who's WhoAmongst America's Teachers. Patricia Brooks’ writing style reads like she is talking to you personally. Let yourself sink into an easy chair, while she shares her vivid memoir of small town Americana and family relationships that shift with the passage of decades. Brooks does not sugarcoat the sad and difficult dimensions of life. Rather, she puts her petite arms around them in a huge way, embracing the pain that teaches. She uplifts us, celebrating the good, the delightful, the Godly inspiration, the laughs, and even the sneaky fun. Read of the younger sister who modeled an independent mind and heart, whose massively joyful gusto fuels Brooks’ writing, speaking, and teaching even today. Let Brooks infuse you with rich nostalgia from the sisters’ childhood in Michigan, school days, relationships, and adult lives. Let her fill your heart with the Gifts of Sisterhood, and you’ll find yourself gratefully and richly celebrating those aspects of your own and your family’s lives. This was a nice read encased with pain, sorrow and finally emotions on a higher level and ability to go on without the one who had passed. Starting out this story gripped me and led me into a wonderful book full of pages and family. Being a true story, I refrain from saying characters as they were indeed real live people. I learned a lot in here about other families and how the deal with certain situations. This story was not dipped in sugar and coated with the perfect way to deal with losing a sibling but had real raw emotions. My only real discomfort was certain parts seem to go on and on and on. Some scenes were repeated later on in the book after a few chapters. I realize this book is healing for the one left behind and to tell her sister's story and that this slow painful memory is becoming etched in one's mind and heart but it was a bit too detailed and repeated. That being said, it certainly is a book worth reading especially if you are dealing with your own loss. 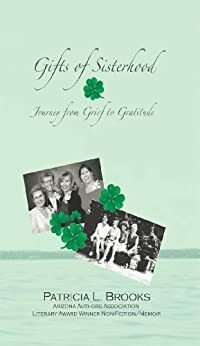 In the `Gifts of Sisterhood: Journey from Grief to Gratitude' book Patricia Brooks pays homage to her younger sister, Roberta. In the book Patricia narrates events leading up to her sister's lung cancer diagnosis then describes the emotional and physical pain of Roberta's passing. This book is beautifully written and Patricia had done an excellent job at brining her poignant story to life. I absolutely loved all the poems, passages, and quotes that were staged throughout the book. I wish all women facing medical and emotional struggles would read this book. Like Patricia, my sister died from cancer. She was diagnosed with breast cancer, and had surgery. She chose not to have chemotherapy, but there still was cancer in her. Patricia's book is very touching in dealing with a sibling who was very special in many ways, and mourning their passing. I also recalled an incident that I felt remorse for not having dealt with properly while she was still alive, but I'm sure she forgave me long ago. I recommend Patricia's book for siblings, sisters or brothers, who lost them to cancer. Patricia's memoir tracks her heartfelt, sensitive, and nostalgic journey as she deals with the loss of her sister to lung cancer. She takes the reader through the steps of the grieving process to the memory of the gifts of happiness she received from having known her sister. Patricia's quote, "Don't let grief be your unfinished business--take care of it" is a premise of her memoir. Her sister is always referred to as "my sister," never by her name, which makes the Gift of Sisterhood therapeutic for anyone going through such a loss. 5.0 out of 5 starsInteresting Read! This book helped me realize what is truly important in life ... not a big house or a fancy car. It's the little acts of loving kindness that we share with others. 5.0 out of 5 starsGifts of Sisterhood Review.